After a forced hiatus of 18 days, Bedford were back in action on Saturday afternoon and gave new manager Jon Taylor a great start to his tenure as the Eagles manager with a 2-1 win at Northwood FC. The new boss included two of his new signings in the starting line-up, with Javia Roberts taking an attacking midfield role and Bilal Yafai placed up front. Christian Lester was also back in the line-up. From the start, Bedford put their hosts under pressure, as Northwood had to contend with the tricky Roberts, as his first cross into the area worried the defence. Although the ball didn’t reach its target of Josh Bamford, it was only half cleared and Kyal McNulty came in with a stinging shot that Berkley Laurencin turned away for a corner. Although the corner came to nothing, the ball still wasn’t properly cleared, and Christian Lester’s angled drive went a bit too high. With both sides in the middle of the table, this was not going to be a one-way game. 17 minutes in, Louis Stead’s free-kick bypassed the Bedford wall, but Tyler Reading got down to his left to palm the ball round the post. A few minutes later, a similar free-kick for Bedford saw McNulty beating the wall, but the ball didn’t dip in time and flew over the bar. Just after the midway mark of the half, Kyle Lincoln’s long ball into the Northwood area was headed on by Lester into the path of James Peters, whose own header, although textbook, was saved by Laurencin. The opening goal came on 28 minutes. Roberts had been threatening with his runs down the wing, and this time, after beating Andy Lomas, put in a cross that Lester directed past Laurencin and into the net. Three minutes later and Roberts dropped a little pass over the defence for Lester to run onto. This time the forward scuffed his shot across goal and off. Bedford doubled the lead in the 37th minute when Lester gave the ball to Jack Jones, on the right wing. Jones whipped in a teasing cross, but Josh Bamford couldn’t get a clean shot in. His effort bounced across the goal, but instead of a defender coming in to clear, Roberts slid in to put the ball in from close range, despite futile claims of offside from the home contingent. With a minute of the half remaining, Mark Burgess had the ball in the net for Northwood, following a free-kick, but had the goal disallowed for offside. If Bedford had more of the possession in the first half, the second 45 minutes belonged to Northwood, as they pressed forward in trying to redeem the game, but perhaps should have left it to the forwards, as defender Jon Munday shot from distance and skied the ball high over the bar. Bedford could have been three goals to the good just six minutes into the half when Lester and Roberts combined to set up Peters. The midfielder had seen his header saved in the first half, and this time, although Peters’ shot beat Laurencin, George Nicholas was on the line to clear. A minute later, Northwood had their own chance go begging, as Jones calmly swept up near the line. Northwood kept taking shots at goal, with Lomas and Burgess both going close. With 20 minutes remaining, a low shot from Niko Muir forced a low save from Reading. Northwood still pressed, and Muir and Rob Hastings both had close efforts. Reading again saved a potential goal after a free-kick was headed goalwards by Nicholas. Bedford came back with a speculative long range shot from Stefan Powell, but the ball flew over the bar. On 90 mins, Max Holland had a good chance to get a goal back, but shot wide of the mark. 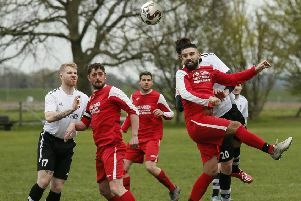 Northwood were rewarded with a consolation goal five minutes into stoppage time when Michael Murray bundled the ball home, but the whistle was just 30 seconds away and Bedford secured a second league win on the bounce, albeit with nearly three weeks in between the two games. Eagles: Tyler Reading, Jack Jones, Kyle Lincoln, Tommy Hull, Dan Crowie, Kyal McNulty, Javia Roberts, James Peters (Stefan Powell 68), Christian Lester (Jamie Osborne 76), Bilal Yafai, Josh Bamford (Daril Ngwala 57). Subs not used: Nat Lewars, Matt Clifford.